– Preheat oven to 200 degrees F.
– Peel and cut mangos into cubes. – Combine mangos and thoroughly rinsed blackberries in a high powered blender. Blend until pureed. – Squeeze mixture through a cheesecloth or nut milk bag (preferred) to remove seeds. This step is optional but I found them to be SO much better without the seeds, it was well worth the extra effort. – Line an 11 x 16 inch baking sheet with wax paper. – Use a spatula to evenly spread puree on baking sheet, giving it a gentle shake to help smooth mixture out. – Place in oven for 4-6 hours or until the top is no longer sticky and fruit can easily be peeled from pan. 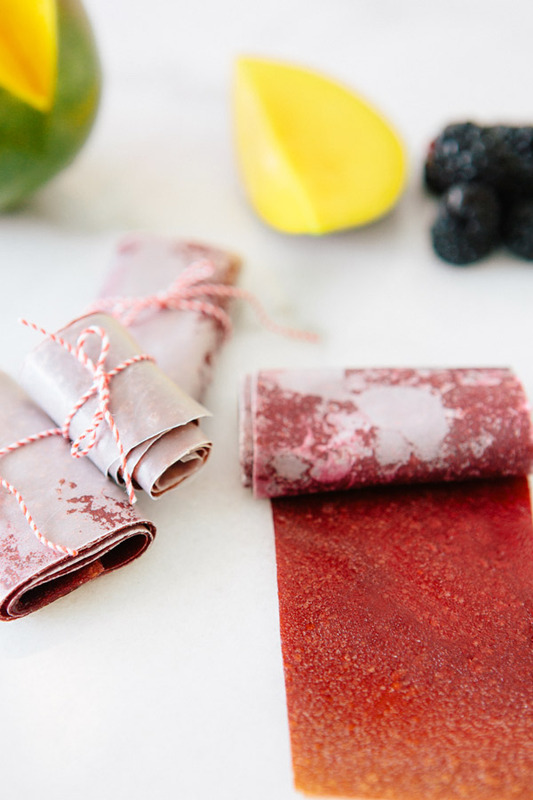 – Place a piece of wax paper over the top and firmly press into fruit leather. Cut leather into strips, roll up and tie with bakers twine! These look great! I wonder how they would turn out using a dehydrator. I may go that route simply because of energy costs. OH EM GEE! 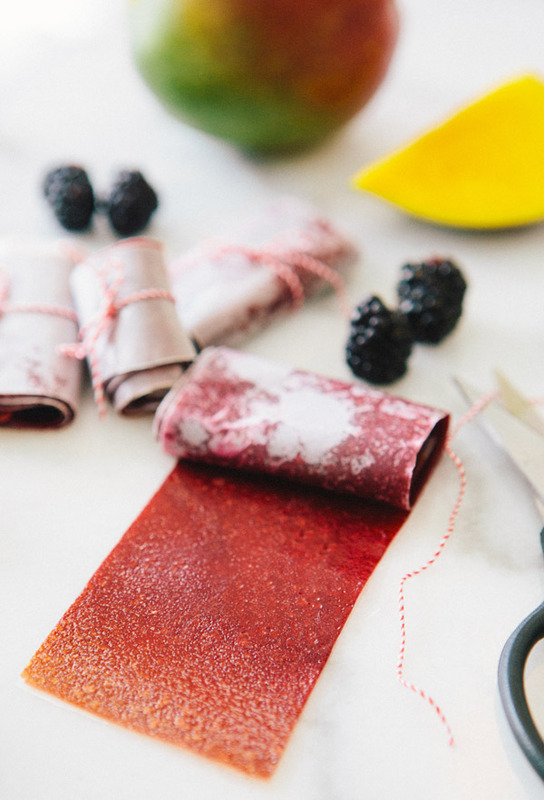 I was so obsessed with *fruit roll ups* as a child, and am SO making these!! Now, hopefully, my daughter can be obsessed with a healthier version! Ok, not too obsessed, because I don't have time for too many of these 😉 I see a ginormous batch in our very near future! Thanks! 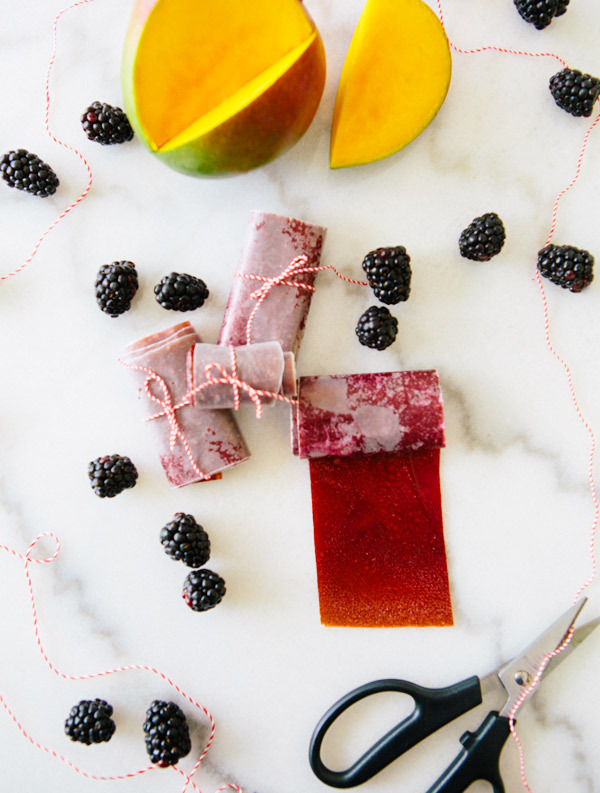 I adore fruit leathers. This is such a fun recipe!! Thank you for your great idea to make what we call "pastila" in Russia. What a great recipe. I loved fruit leathers too. But I'm so much more excited that these are made with fruit only!! The fruit combination are deliciously endless!! amazing idea, i love leathers but it would be so great to make them at home! Wow, sounds and look delicious. Ill definitely try this one of these days. Love this recipe, thank you so much. Will be sure to make this for my children soon! loving all your recipes! These look incredible! Thanks for the recipe! Looks delish! I'm sure my kids (and I) would love this. I think I better try making this myself! gotta love two ingredient recipes 🙂 sounds amazing! It sounds so simple and good! We've got similar food in Russian markets. It's called pastila. I love this!!!! The baby’s favourite 2 foods are mangos and blackberries – it’s like hitting the jackpot. Thanks for posting this. at the very least, support you if not join you in your volunteer projects. You could be avoiding his call just to have control over when you talk. or even just friendship. One should recollect that the Taiwanese girls are very attractive and sociable. they create news headlines to grab people interested. Um tried this and it is impossible to get the wax paper off. The wax paper also stuck to the pan as well. I suppose we should have tested only one cookie sheet first as opposed to four of them. Anyone else try this recipe? Any tips?